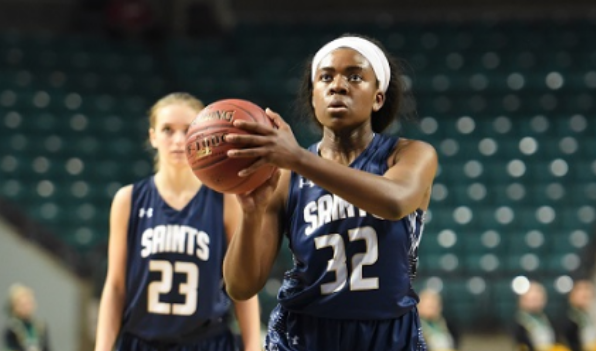 Sereena Weledji, Aquinas, 6-0, Sr.
Weledji led the Saints to their third straight state title with a 54-40 win against Bishop Carroll in the state title. She formed one-third of Aquinas’ potent size, along with 6-2 Allison Thomas and Alayna Townsell. They combined for 27 points in the title game. In the semifinals, Weledji delivered 15 points and seven rebounds in a 41-34 victory against Maize. She delivered 17 in a 27-point victory against Salina Central in the first round at state. Known for her defense, she helped Aquinas hold teams to just 33 points a game. A three-time first team all-state player, Weledji exceeded 1,000 career points after she averaged 11 points, seven rebounds, three assists and three steals as a junior. Weledji has excellent academic/athletic roots. One sister plays for Princeton, another for Brown and their dad participated in soccer at Boston University.